Vladimir Makovsky had an outstanding talent and a fine sense of humor. Many of his works make you smile, even if your heart is heavy and sad. However, humor is not all. The artist’s works are based on deep philanthropy and compassion. Facing humiliation, indifference, disregard for people, the master reacted keenly and zealously. 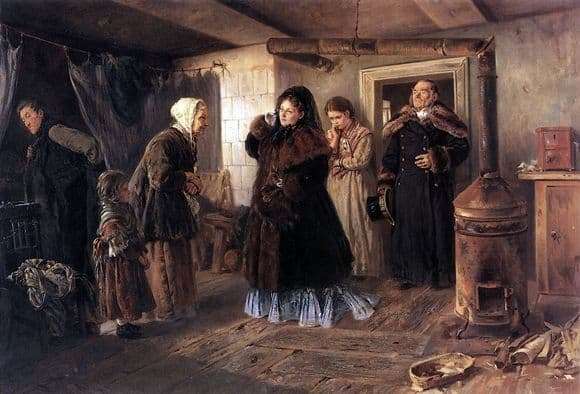 Such an attitude of Makovsky, as well as possible, is reflected in the painting “A Visit to the Poor”, published in 1874. The main characters of the picture are radically different status and wealth. On the one hand depicts a rich lady, dressed in furs and jewelry. Behind her stands a servant overwhelmed with arrogance. A footman looks around contemptuously. The miserable atmosphere of the room is unpleasant to those present. Only a young girl is amazed and filled with sympathy. They have arrived to assist the distressed family. However, their impulse is devoid of sincerity. This is nothing more than a tribute to the far-fetched fashion of that time. In the foreground are a woman and a child, bowed their heads in a contorted courteous pose. The head of the family frantically puts on his best, but already worn coat. The poor are humiliated, exhausted and feel the full bitterness of their existence in the background with the rich people who have arrived. The work is filled with indignation and expresses the artist’s attitude towards glaring injustice. Social inequality, hypocrisy, negative attitude towards the poor – all this is brought together on the canvas. Such behavior is not only incapable of getting ordinary people out of poverty, but it also causes them deep heartache. You can see the picture by visiting the Tretyakov Gallery in Moscow.